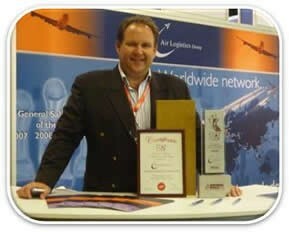 On the 21st February 2013, during Air Cargo Africa in Johannesburg, the Stat Times International Awards for Excellence in Air Cargo took place. Votes had been cast by air freight executives worldwide and the winners were announced during a sparkling gala dinner and awards ceremony. We are pleased to announce that Air Logistics Group was announced the winner of the ‘International General Sales Agent of the Year in Africa' award for 2013. The Stat Times International Awards for Excellence in Air Cargo, established in 2006 celebrate the achievements in the global air cargo industry. “It is fantastic to be recognised with this award and I would like to thank our customers for their support and would like to congratulate all our staff, as without you, this success would not have been possible,” adds Shawn McGuinness, General Manager Central & Southern Africa, Air Logistics Group “We look forward to an exciting future and the opportunities ahead of us here in Africa”.